We were pondering this question and determining if we might go for Christmas (this year or next). There are many reasons we go to Italy and they are all positive. in fact we have no negative reasons for not going. The country is beautiful. The beaches are among the best in the world and the mountains are spectacular. The food is fantastic. Italian food in Italy is nothing like Italian food here in the US. It is so much better. Fresh ingredients cooked to perfection. Forget Fettuccine Alfredo and chicken or shrimp parmesan. They don’t exist in Italy except in tourist places (and you don’t want to eat there). The bread is to die for! 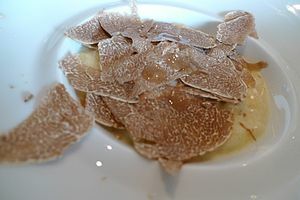 Don’t forget gelato, chocolate or the famous Italian white truffles. The wine is top-notch. Italy produces some of the best wines in the world. Everyone in Italy drinks wine and understands it. From the greats like Chianti to Barolo and Brunello. Even the local wines are fantastic. Try them! The people are friendly. Italians love Americans and are very friendly. You find great people from small cities to the largest cities. There is little crime in Italy. You do find pick pockets in the larger cities but violent crime is almost nonexistent. We felt safe walking small streets in Rome at midnight. Tradition exists here. Everyone was brought up on Italian tradition and pass it on to their children. Art exists everywhere. We describe Italy as an open air museum. The art and architecture are everywhere you look. Yes the museums are still important to see but Italy is a huge museum. The language is beautiful to hear. It is like hearing a song when they speak. Italy is about relaxing, family, friends, food and wine. Enjoy it! Italy is romance. Get reacquainted with the one you love and be romantic. Take your pen out right now and add Italy to your bucket list. Don’t just add it, VAI (GO)! When you go don’t be an American or think like one. This is not America. Be an Italian and enjoy your vacation like no other you have taken. The long trip home on the airplane will find you with a smile and many good memories.